This perfectly Moist Vanilla Cake Recipe is a slightly denser than average cake with a tight crumb. Instead of light and fluffy this is more like a sponge cake. It’s packed full of vanilla and after the first bite, you know it’s homemade. 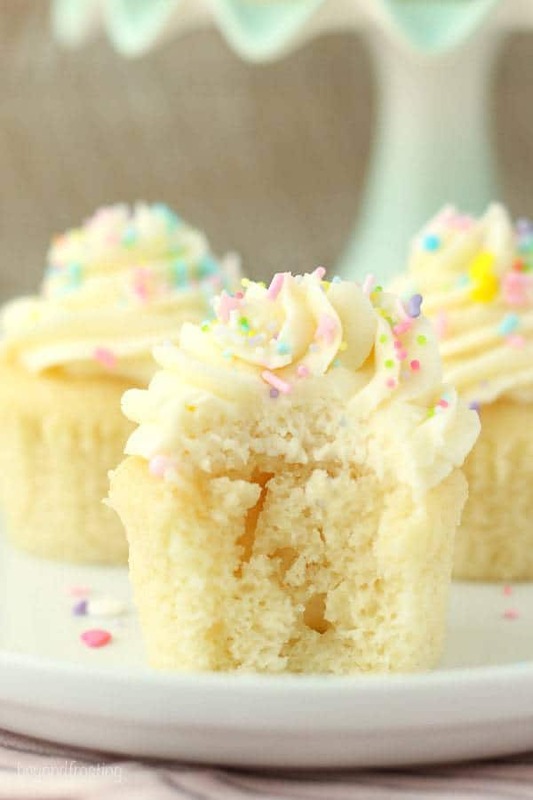 This vanilla cake recipe can be made as vanilla cupcakes and it’s very versatile. You can alter the flavor with lemon, lime or even almond extract. For the longest time, I’ve wanted to have a homemade and versatile vanilla cake. I’ve shied away from the task, fearing I would not be up to the challenge. 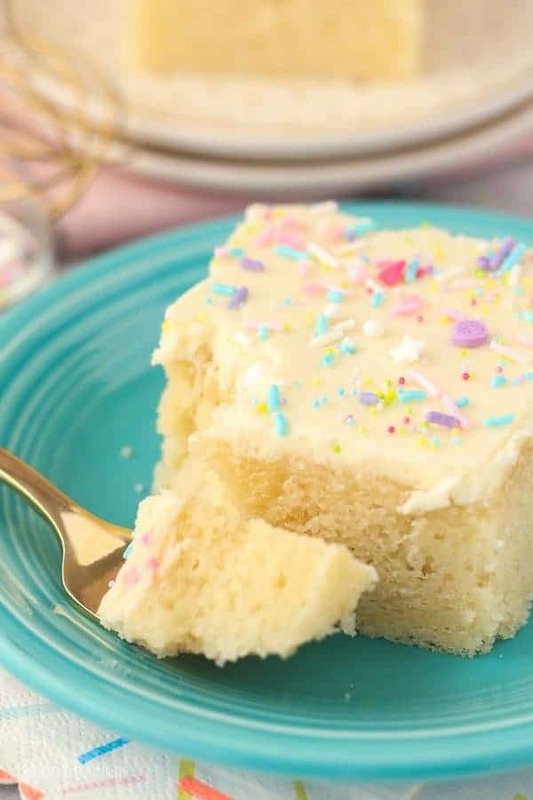 While the majority of you don’t seem to mind a cake mix, some of you have ask for a homemade versions of my recipes, so I am thrilled to be able to give you such a wonderful and moist vanilla cake recipe. Several weeks ago, my fiancé made a zucchini bread recipe from his childhood, and when he described it, he said it was much more cake like than my banana bread recipe. So I thought to myself, maybe I’ll start here, adjusting the recipe as I go to get to where I wanted to be. This perfectly Moist Vanilla Cake Recipe is a slightly denser cake with a tight crumb. Instead of light and fluffy this is more like a sponge cake. After the first bite, you know it’s homemade. It bursting with vanilla flavor. 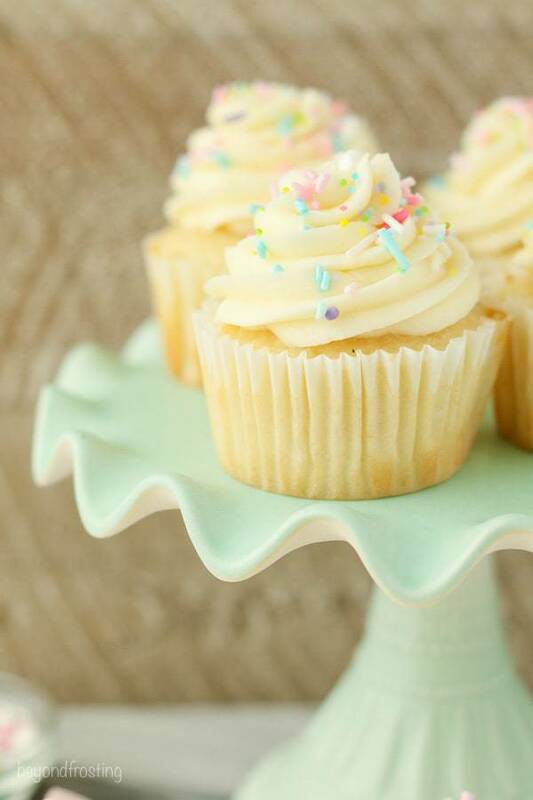 As shown in this recipe, I’ve topped this cake with my tried and true vanilla frosting. Eight. Eight is the number of times I baked this cake before I decided it was just right, tweaking ingredients along the way. Then I baked it 3 more times but in the form of cupcakes to make sure it would be easy for you to use this recipe in a variety of ways. 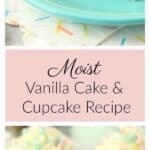 That’s right, this moist vanilla cake recipe can be made as a cake and also as vanilla cupcakes. For the cake, you’ll use a 9″ by 13″ inch pan. 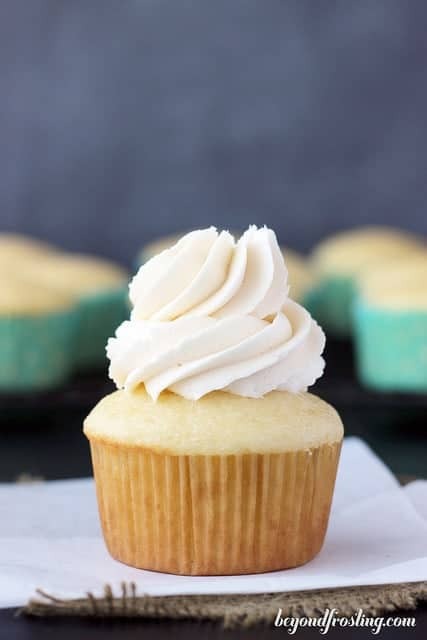 If you choose to make vanilla cupcakes, this recipe will make a hefty 24 cupcakes with a little batter left over. The best way to make the cupcakes is to use a large cookie scoop to ensure the batter is evenly divided between each liner. This batter is on the thinner side, so the cookie scoop works perfectly. For the best results you should store the finished cupcakes in an airtight container. I’ve shared plenty of tips for baking cupcakes, but using a cookie scoop is by far the best way to get consistent results. 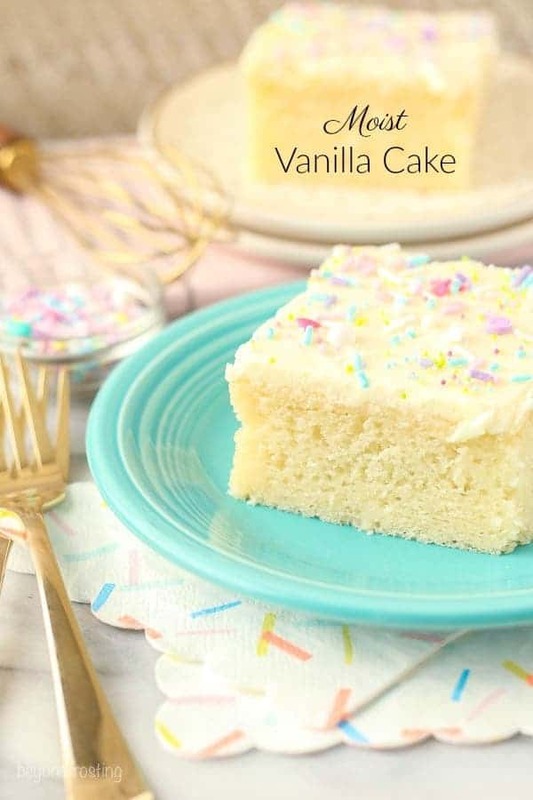 This vanilla cake recipe has your standard ingredients: sugar, flour, baking powder and salt. You can’t really have a cake without those. A lot of recipes use similar amounts of dry ingredients. However, where most cake recipes vary is in the amount of fats (butter or oil), eggs and any other wet ingredients. For this cake, the wet ingredients are vegetable oil, eggs, vanilla extract and milk. Plus my secret weapon, light sour cream.The sour cream is the ultimate tool to keeping this vanilla cake moist, even after 3 or 4 days! Since this cake uses oil instead of butter, there’s no waiting around for your butter to come to room temperature (you know I am terrible at planning that type of thing! ), and far less time is spent creaming together the butter and sugar. Oil tends to make cakes more moist than butter. It also makes the crumb and texture a bit more tender. With any baked good, there is a certain level of balance needed when you’re preparing the batter. If you over beat the batter, your cake will be too dense and it will not rise. If you under beat it then it can cause your cake to bake unevenly because the oil and eggs are not well incorporated. My rule of thumb is to turn off my mixer when I can’t see any more loose flour on top. Then I use my spatula to stir the batter a few times, getting all the stuff that is stuck to the bottom of the bowl and bringing it up to the top. When I’m making cupcakes, I tend the stir the batter with my spatula every 5 or 6 cupcakes. 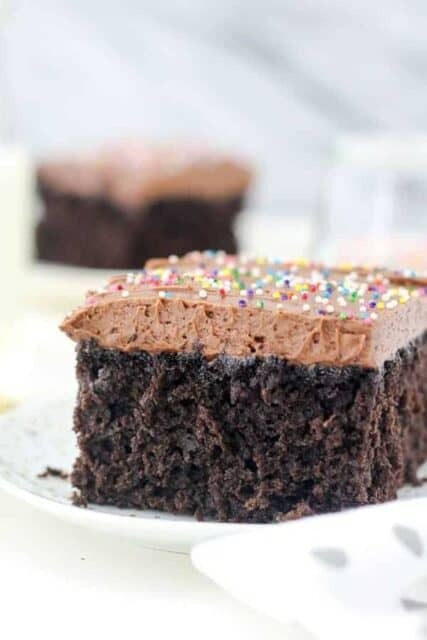 However, even though the batter is a little thinner, the cake is more dense when baked and therefore it will not rise as high as a cake with a more light and airy texture. This won’t be a problem for us! If you’re planning on using this cake for as a base for a poke cake or some other type of “wet cake”, I suggest omitting the sour cream. This will produce a lighter cake, allowing more space in the crumbs to soak up the filling. I have made this as an 8-inch 3 layer cake. See my recipe for the Moist Vanilla Layer Cake. If you’d like to bake this as 9-inch or 10-inch layer cake, the baking times will need to be adjusted accordingly. As I mentioned above, sour cream helps keeps these cupcakes very moist. I recommend substituting the sour cream with non-fat Greek Yogurt if you do not have sour cream. Some people have made it with mayonnaise but I have not tried it myself. A few people have asked about substituting buttermilk for sour cream. I have never tried this, and this batter is already pretty thin, so I am not sure if adding additional liquid will work. If you need to, you can omit it completely, but note the cake will not be nearly as moist. Do I have to use nonfat milk or can I substitute it with something else? Yes, you can use any type of milk for this recipe. I had to bake my recipe for longer than the required time, what did I do wrong? Likely nothing! Different types of pans will bake differently. Glass baking pans will always need to bake longer as they do not conduct heat as quickly as metal pans. Disposable containers are much thinner and thus require additional baking time. Also keep in mind that not all oven temperatures are alike, and unless you have an internal thermometer, your oven temperature could be off. Looking for a few other recipes using this moist vanilla cake? However about someCookies and Cream Cupcakes, Mimosa Cake or homemade funfetti cake? After a lot of requests, I’ve also added a chocolate version of this cake. 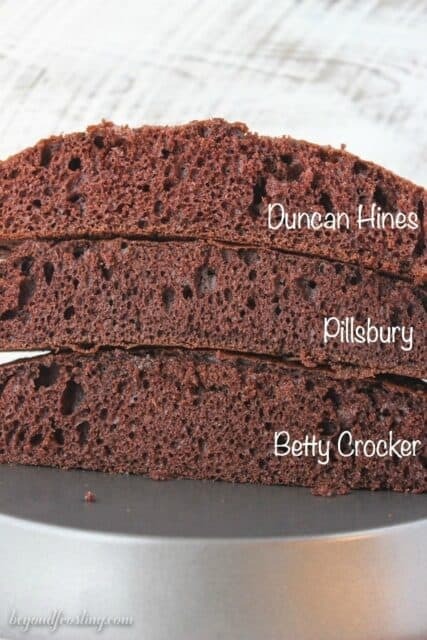 My moist chocolate cake is less dense and more light and fluffy. It’s not overly sweet but once it’s frosted, it’s a perfect match. This perfectly Moist Vanilla Cake Recipe is a more dense cake with a tight crumb. Instead of light and fluffy this is more like a sponge cake. It’s packed full of vanilla and after the first bite, you know it’s homemade. Pour the batter in a 9-inch by 13-inch pan and bake at 350°F for 28-32 minutes, keeping a careful eye on the baking during the last few minutes. Remove from the oven and allow to cool completely. Test the cake for doneness by inserting a toothpick into the center of the cake. If the toothpick comes out clean, your cake is done. This cake is topped with a half batch of my Perfect Vanilla Frosting. This cake will not produce a very high rise but that’s okay! If you’re making a more “wet” cake such as a poke cake, I would suggest eliminating the sour cream to produce a lighter and fluffy cake. I used an aluminum pan. Baking times will vary by pan type and true internal oven temperatures. I was wondering if cake flour can be used instead of regular flour? Was looking for a simple vanilla cake using oil rather than butter. This was perfect – so moist. I used Almond milk and grape seed oil and kept with the sour cream. There was enough for 4 layers matched with vanilla cream butter icing and jam, covered in fondant – yum yum. Even better it was so quick to cook, only 25 mins for all layers ( 175 degree C).. Thank you all the way form NZ! That’s GREAT! Thank you Suzanne for sharing! I love the idea of adding some jam! Hi Rachel, thank you so much for sharing!! I am so glad that you enjoyed this recipe and thanks for sharing your baking experience. Sara this is AMAZING!!! Thank you so so much for sharing, this just makes my day. Happy 1st birthday to your son! That is awesome Kate!!! I am so glad you like it! 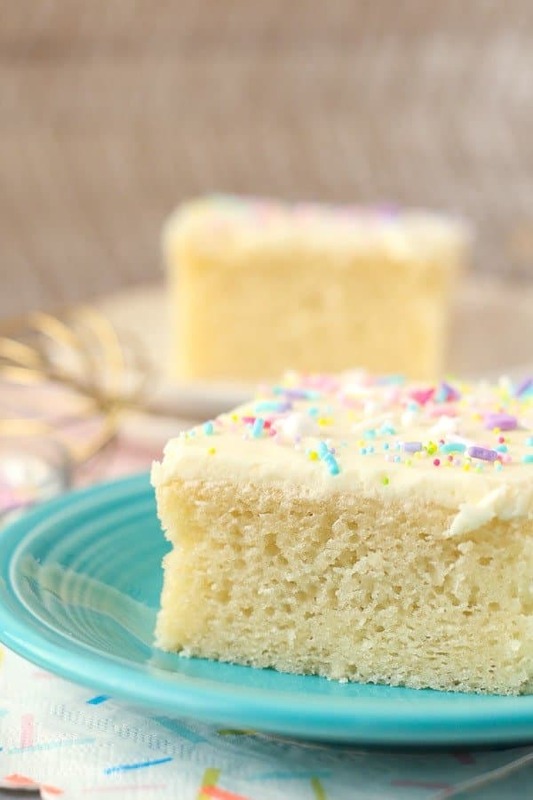 Hi, I really love the sprinkles used on this vanilla cake….where did you get them from? Do you have a pic of the container? Hi Tiffany, these are from Sweetapolita, I don’t think that one is available anymore, but there’s so many sprinkle medleys to chose from! How can I make the in chocolate? Hi Betty, the recipe for the chocolate version is a little different. 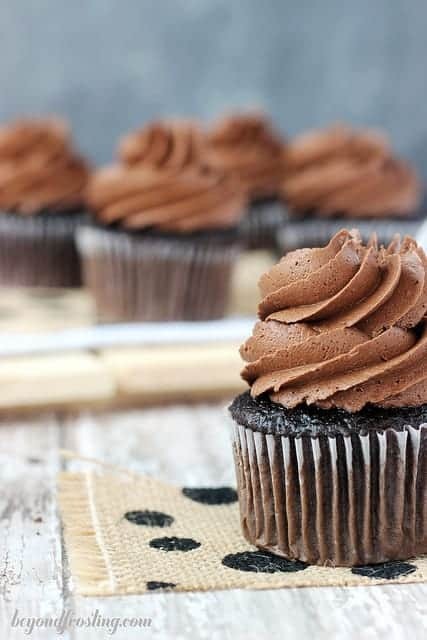 Look for Moist Chocolate Cupcakes. Depending on your climate. If you are in a humid or hot environment, you’ll probably need to refrigerate it. I live in a mild climate and I store it on my counter in an airtight container.